Ground Zero Coffee Company - Java-Pedia: fun coffee facts and more! Ground Zero Coffee education - What's in that cup, anyway? Looking for the ground level of coffee history and little-discussed coffee facts? Hoping for a scoop-full of useful information in your 16-ounce bag of coffee cut-ups? This is the brain teasing, tortuous path that lead our nation into its richest, most flavorful blend of coffee drinks. This is the kind of detail that will make some people eager for their next cup, and others just wondering, how did they come up with that? FAT MAN & LITTLE BOY - Two potent names for two potent coffees. Coffee is not just a bean. Heck, it isn't even a bean at all. It's a special kind of cherry, grown in a very special place, high, high on a mountain top (or somewhat lower if you know what we mean), and then skinned, sorted, spun around in whirly thingies, spread out to dry, walked on, bagged, shipped, heated, cooled, ground, and brewed, finally to arrive, after all that work, in your morning cup. Good morning! Here's the twist. 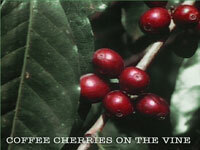 There are two popular kinds of cherries: Arabica and Robusto. There are others, but these two are what you hear about most often. The reason people go on about the virtues of their Arabica beans is that they're more flavorful and less bitter, because they're grown higher in the mountains. Arriba Arabica! Robusto beans are still coffee, all right, but because they don't have the benefit of being high-born, they're a little bitter. Poor Robusto. 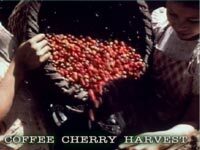 Coffee harvesting really is cherry picking. The tree produces its fruit in an ongoing season. Some cherries may be fully ripe, while others are just getting started. You don't simply shake off all the fruit - you don't want the unripe ones before they're out of the shower and dressed for work. Though it's more work for the pickers, it means new coffee beans are becoming ready every day - what an ingenious plan! 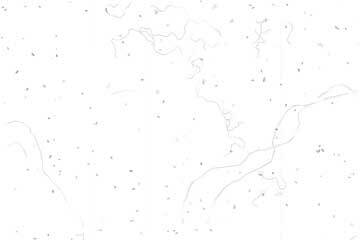 copyright 2006-2008, Academy Leader, Inc.